It baffles the mind how somebody could enter a school and kill innocent students. In 2012, educational facilities have started to create prevention programs that will prohibit any student from attempting this kind of violence. Schools have imposed strict laws against weapons and will expel any child that brings a gun or knife to school. Authorities have also started to take online threats seriously. Police will do whatever it takes to prevent this kind of violence, including presenting information on past cases and giving links between killers and the media. Most people who carry out school shootings commit suicide. This suggests that the culprits don’t want to deal with the consequences of their actions. It also prevents authorities from interviewing the killers. A large amount of school shooters are silent during the attack and have been known to give blank stares. 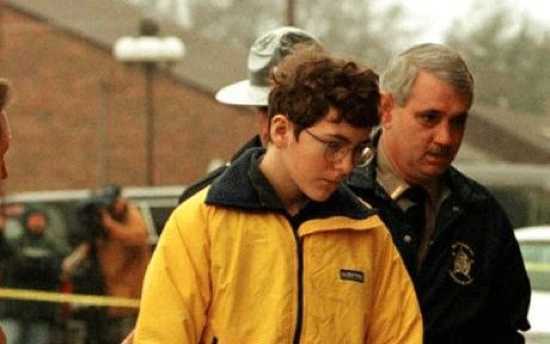 Some notorious killers who didn’t say a word are Seung-Hui Cho during the 2007 Virginia Tech massacre and Thomas Hamilton during the 1996 Dunblane school massacre. After a school shooting, it is important for authorities to interview witnesses and get their stories. In many cases this can be difficult because young victims will become traumatized by the violence. Research shows that people who carry out school shootings are usually social outcasts, full of rage, and show little signs of remorse or regret during their crimes. This article will focus on ten chilling quotes given by school shooters. On February 2, 1996, a 14-year-old boy named Barry Loukaitis entered Frontier Middle School in Moses Lake, Washington and killed his algebra teacher and two students. Loukaitis was dressed in a wild west-style gunslinger outfit and had a black duster on. He was armed with a hunting rifle and two handguns. Upon entering the classroom, Loukaitis attacked the students in a fit of rage and quoted: “This sure beats the hell out of algebra, doesn’t it?” The quote came from a Stephen King novel titled Rage. During the rampage killing, Loukaitis held the students hostage for ten minutes before a gym coach named Jon Lane came in the room and wrestled him to the ground. 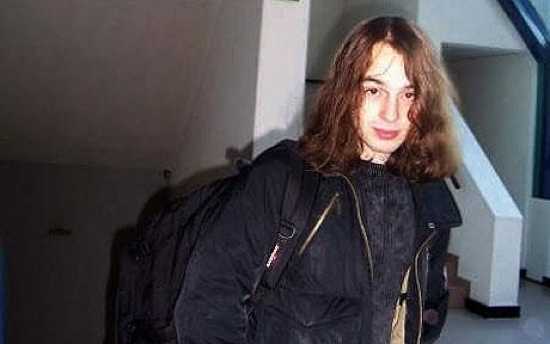 At his trial the defense attacked the media, specifically Pearl Jam’s video Jeremy, the films Natural Born Killers and Basketball Diaries, and Rage. They argued the fact that Loukaitis was on Ritalin at the time of the murder spree. In court, Loukaitis stated that he attempted to model his life after Rage’s protagonist Charlie Decker. Despite his young age, Loukaitis was sentenced to life in prison without the possibility of parole. On December 1, 1997, a 14-year-old boy named Michael Carneal carried out a rampage killing at Heath High School in West Paducah, Kentucky. On the day in question, Carneal wrapped two shotguns and two rifles in a blanket and took them to school, passing them off as an art project. He also carried a loaded .22 pistol in his backpack. Upon arrival, Carneal immediately put in earplugs, took out the pistol, and fired eight rounds into a prayer group that was sitting outside the school. He was standing at point blank range and killed three young girls. According to survivor Benjamin Strong, after Carneal fired the weapon, he instantly dropped the gun and said “Kill me, please. I can’t believe I did that.” He then put his hands up in the air and surrendered to the school’s principal Bill Bond. Carneal was questioned by an English teacher and said: “It was like I was in a dream, and I woke up.” The quote is eerily relevant to a scene in the movie Basketball Diaries. In the movie, a character played by Leonardo DiCaprio carries out a school shooting in a dream sequence. The scene has become one of the most controversial in film history. Around the age of 16, Kim De Gelder started to display signs of strange behavior. He dressed in dark clothes and was obsessed with horror films. One of his favorite movies was The Dark Knight, starring the late Heath Ledger as the Joker. On January 23, 2009, exactly one year and one day after Heath Ledger died, Gelder (aged 20) entered the Fabeltjesland daycare centre in Dendermonde, Belgium, and attacked a collection of small children with a knife. He was wearing an outfit similar to Ledger’s character of the Joker, with white makeup and red hair. The bizarre quote is reminiscent of a scene in the Dark Knight movie when the Joker violently gatecrashes a party looking for the character of Harvey Dent. “I only have one question: where is Harvey Dent? I’ll settle for his loved ones,” says the character played by Ledger, before threatening a woman with a knife. The media quickly picked up on the similarities between Gelder’s actions and the Batman movie, including the fact that the name Gelder is an anagram for Ledger, but investigators have dismissed the coincidence and said it is not relevant. In 2012, it was reported that Kim De Gelder will be held accountable for his actions and tried in a court of law. 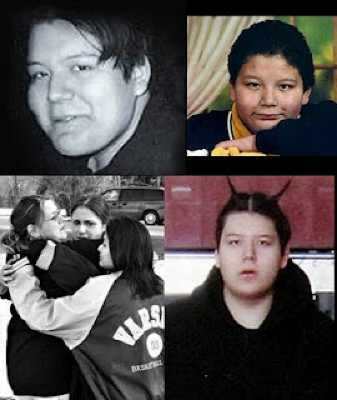 The fifth deadliest school shooting spree in United States history occurred on the Red Lake reservation in Red Lake, Minnesota. 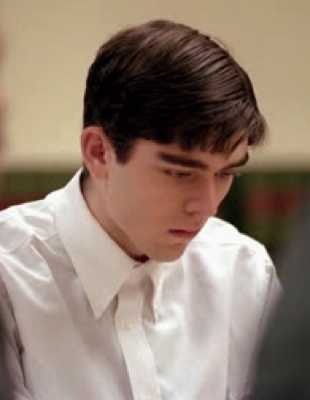 On March 21, 2005, a 16-year-old boy named Jeffrey Weise killed his Grandfather (who was a police officer) and then traveled to Red Lake Senior High School with his Grandpa’s weapons, including a .40 caliber Glock 23 pistol and a Remington 870 12 gauge pump-action shotgun. Weise entered the school and immediately killed an unarmed security guard who was manning a metal detector. Jeffrey Weise then entered the halls and began to fire random shots. He headed toward a math classroom that was full of students. After realizing the door was locked, Weise used the shotgun to blow a hole in it. He entered the classroom wearing a black hooded trench coat, a black bandanna, black military boots, and black pants. As soon as he entered the room a teacher spoke up: “God be with us.” This caught the attention of Weise and he shot her. Weise then aimed at another student named Chon’gai’la Morris, and asked, “Do you believe in God?” Morris answered “no” and the gunman turned away to find another target. The quote is reminiscent of the Columbine High School massacre. 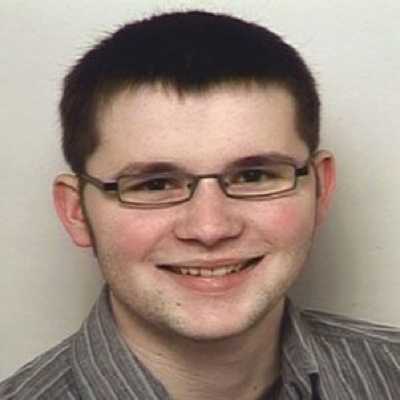 Weise then attacked a collection of four students who were huddled on the floor. Witnesses say that he was smiling during the shooting. After leaving the classroom, Weise returned to the main entrance of the school where police were waiting. He engaged in a shoot-out with the police which lasted about four minutes and was shot twice. Weise then retreated to a vacant classroom and committed suicide. In all, Jeffrey Weise murdered nine people and injured five others. The high caliber pump-action shotgun contributed to the damage inflicted by the killer. The shooting spree lasted only nine minutes, with the murders occurring in a three minute span. One of the worst attacks in the history of Japan occurred on June 8, 2001, at Ikeda Elementary School, which is a primary school affiliated with Osaka Kyoiku University in Osaka Prefecture, Japan. On the day in question, a 37-year-old former janitor named Mamoru Takuma entered the school with a knife and went crazy. He stabbed 23 people and murdered eight kids between the age of seven and eight. Takuma was eventually tackled by the school’s staff and arrested. After the attack, Takuma was described as being in an extremely confused state of mind. He kept repeating the sentence “I went to the elementary school” and then saying “I went to the train station and stabbed 100 people with my knife. I did not go to the elementary school.” He said: “I’ve become disgusted with everything. I’ve tried to kill myself several times, but couldn’t. 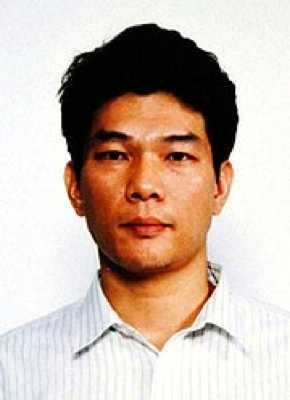 Give me a death sentence.” On September 14, 2004 Takuma was executed by way of hanging. At his trial, Mamoru Takuma was removed from the court after yelling at the victims’ families. He refused to apologize for the crimes and read the statement: “I should have used gasoline, so I could have killed more than I did.” The quote is chilling and can be linked to a horrible school attack that occurred in China in 2006, when Bai Ningyang entered a kindergarten and killed 12 people, mostly small kids. During the Shiguan kindergarten attack, Ningyang poured gasoline on the floor, locked the door, and started a fire. The rampage of Mamoru Takuma has spawned a series of copycat crimes where spree killers have used knives. On the morning of April 7, 2011, a 24-year-old man named Wellington Oliveira traveled to Tasso da Silveira Municipal School, which is an elementary school in Realengo on the western fringe of Rio de Janeiro, Brazil. After gaining access to the school, Oliveira, who was a former student, entered an 8th grade classroom. Accounts say that Oliveira was initially very polite to the students and saluted the children, but then opened fire on the class with a .38-caliber revolver and a .32-caliber revolver. Oliveira specifically targeted girls and shot boys only to immobilize them. He murdered 12 students, ten of them being female. The school shooting was the first of its kind in Brazil. Wellington Oliveira came to the school with a suicide note in his pocket, but his quotes during the attack were not published. It was revealed that Oliveira was badly bullied in school and called strange. His classmates used to call him “Sherman” (an allusion to a character from American Pie), as well as “suingue” (swing), because he had a limp leg. Two days before the shooting spree, Wellington Oliveira made a video and is quoted saying: “The struggle for which many brothers died in the past, and for which I will die, is not solely because of what is known as bullying. Our fight is against cruel people, cowards, who take advantage of the kindness, the weakness of people unable to defend themselves.” He was clearly a delusional person that suffered from extreme rage and psychopathic tendencies. On April 20, 1999, two senior students named Eric Harris and Dylan Klebold entered Columbine High School in Colorado and attacked the student population with an arsenal of weapons. They killed 13 people and wounded 22 others. The event was one of the longest shooting sprees in history and lasted 49 minutes. During the attack Klebold and Harris talked to their victims and individual accounts have surfaced with some unthinkable quotes. It is unclear exactly how many times the killers asked their victims if they “believe in God,” but many cases have been reported. The first victim of the massacre was a girl named Rachel Scott. It was initially reported by the media, but later dismissed by the FBI, that Eric Harris began the shooting spree by asking Scott if she believed in God, in which she replied in the affirmative and Harris shot her. After killing Scott, Harris and Klebold entered the school and opened fire on the students. Approximately five minutes after the first shot was fired, a Jefferson County deputy sheriff arrived on the scene, saw the culprits, and fired his weapon at them. Harris and Klebold noticed the officer and returned fire. However, the deputy did not pursue the killers into the building. In one case, Harris knelt down under a table in the library and said “peek-a-boo” before shooting a young girl named Cassie Bernall in the head. It was widely reported after the shooting that Harris asked Bernall “if she believed in God” before shooting her, but it was later determined that Klebold said the phrase to a different student named Valeen Schnurr. Some people who were trapped in the library have said that they heard both Harris and Klebold utter the phrase during the massacre. While inside of the library, the pair found an acquaintance named John Savage who asked them what they were doing. Klebold replied: “Oh, just killing people.” The killers then began to make comments about how they no longer found a thrill in shooting their victims. Klebold: “Maybe we should start knifing people that might be more fun.” Approximately 49 minutes after the shooting started, Harris and Klebold said “one, two, three” before committing suicide in the library. SWAT team members did not enter the school for one hour and one minute until after the killers committed suicide. Their bodies were not discovered for three hours. One of the most shocking attacks against women occurred on December 6, 1989 at the École Polytechnique in Montreal, Quebec, Canada. The École Polytechnique is an engineering school affiliated with the University of Montreal. On the day in question, a 25-year-old man named Marc Lépine entered the school wearing a white cap and armed with a semi-automatic rifle (Mini-14) and a hunting knife. After walking around the school for a short time, Lépine went into a mechanical engineering class and ordered the male and female students to separate themselves. In total, there were nine women and around fifty men in the room. Lépine told the men to leave the room and then started to speak in French to the women. He told them “I am fighting feminism. You’re women, you’re going to be engineers. You’re all a bunch of feminists. I hate feminists.” With those words he started to shoot the students from left to right, killing six, and wounding three. Lépine then continued the massacre by walking around the school and selecting random female students to kill. At one point during the rampage, Lépine entered the cafeteria with over 100 people inside and began to shout at the victims. He let some people go and shot others. 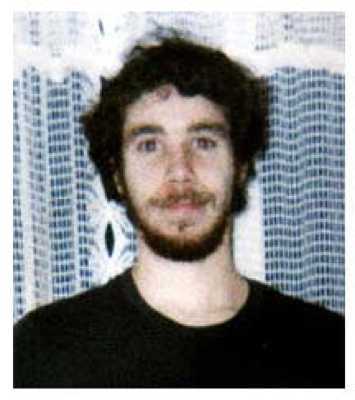 Twenty minutes after the initial bullet was fired, Marc Lépine committed suicide after stabbing a women to death. 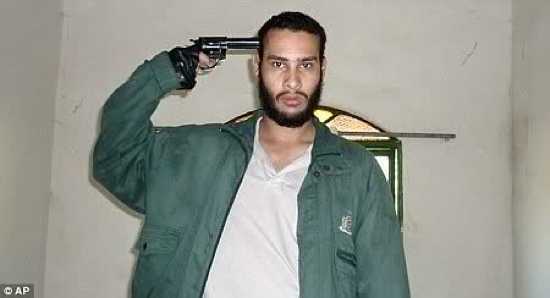 In the event, he shot twenty-eight people and killed 14 women. It is the 7th most deadly school shooting spree in history. The killings shocked the world and Lépine’s statements during the massacre led people to see the rampage as an antifeminist attack. The students who survived the shooting were greatly affected and a number of them have since committed suicide. Today, December 6, 1989, is commemorated as a day of remembrance for violence against women. Tim Kretschmer grew up in the district of Winnenden, in southwestern Germany. On the morning of March 11, 2009, Kretschmer traveled to his former secondary school in Winnenden armed with a 9mm Beretta semi-automatic pistol, 15-round magazines, and more than 200 rounds of ammunition. He was dressed in black combat clothing and had a gas mask. Upon entering the school, Kretschmer went toward a chemistry classroom full of 14- and 15-year-old students. He entered the room and immediately started shooting. Over the next two minutes, Kretschmer murdered eight girls, one boy, and three female teachers. He targeted females and shot his victims in the head. During the massacre, Kretschmer walked in and out of the chemistry classroom no less than three times. On the last visit he spoke his only words in the school: “Aren’t you all dead yet?” The chilling quote shows the killers disregard for life and manic state. Immediately following the start of the attack, the school’s headmaster broadcast a coded announcement saying “Mrs. Koma is coming,” which is amok spelled backwards. The message was a safety measure installed to alert the teachers of a school shooting. Two minutes after the rampage started, three police officers entered the building and interrupted the attack. Kretschmer quickly fled the scene and killed a 56-year-old gardener (caretaker) of a nearby psychiatric hospital. He carjacked a vehicle driven by a man named Igor Wolf and ordered him to drive out of the area. While in the car, Wolf asked Kretschmer why he murdered the children? The response came: “For fun, because it is fun.” Kretschmer also said: “Do you think we will find another school,” in which Wolf changed the subject. In a daring escape, Wolf steered the car toward a grass verge and jumped from the vehicle. Kretschmer then left the scene and entered a Volkswagen car showroom where he killed two more people, firing thirteen shots into each victim. Kretschmer left the building and started to shoot in all directions. At this point, somebody captured cell phone footage of Kretschmer getting shot in the leg by police. The tape cuts out and doesn’t show his suicide. In the event, Tim Kretschmer killed 15 people. The school shooting is the 5th most deadly in world history. Growing up in the city of Erfurt, Germany, Robert Steinhäuser appeared to be a relatively normal teenager. In October of 2001, he was expelled from Gutenberg Gymnasium for using a forged medical certificate. Following that, Steinhäuser fell into a world of delusional anger and was determined to get revenge against his former school. 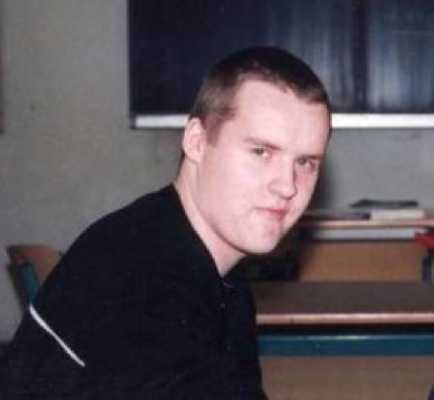 On April 26, 2002, Robert Steinhäuser (19-years-old) armed himself with a 9mm Glock 17 and a Mossberg 590 12-gauge pump-action shotgun and went to the Gutenberg Gymnasium (secondary school). After gaining access to the school, Steinhäuser changed his clothing into a black ninja-style outfit with a mask. He then took the Glock 17 and moved from classroom to classroom, pausing briefly in the doorway to shoot the teacher. Steinhäuser did not target students, but was determined to murder all the school’s faculty. Five minutes after the shooting started, Erfurt police arrived at the scene. Steinhäuser then went to a window and fatally shot a police officer in the head. He removed his mask and was confronted by a teacher named Rainer Heise. Mr. Heise established deep eye-contact with Steinhäuser and said, “Du kannst mich jetzt erschießen” (“You can shoot me now”). In response, Steinhäuser answered, “Herr Heise, für heute reicht’s” (“Mr. Heise, enough for today”). Heise lured Steinhäuser into an empty classroom and locked him inside. A few moments later, Robert Steinhäuser committed suicide. In total, he fired 71 rounds and murdered 16 people, 13 faculty members, 2 students, and 1 police officer. The rampage is the 4th most deadly school shooting spree in history. Steinhäuser’s last words were used as the title of a very controversial book about the massacre written by Ines Geipel.